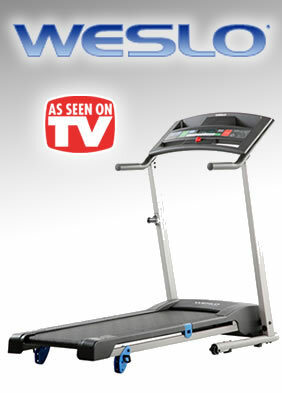 Weslo treadmills are an excellent choice if you’re looking to shed pounds and get into shape but are on a tight budget. Weslo specializes in designing and manufacturing affordably priced home fitness solutions that don’t skimp in the least on features and quality. Weslo’s motto is “Fitness For Real People” and it shows in their high quality and economically priced home exercise equipment. Weslo Cardio Stride Plus treadmill offers the essential features you need to get fit for an attractive price that’s very easy on all budgets. Features like the dual flywheel for a smooth workout experience, multiple position incline, and the spacious treadbelt surface add up to an exercise solution that’s designed to ensure you get a great cardio workout. The Cardio Stride Plus also features Weslo’s exclusive Step-by-Step control panel and display so all of your important stats are available at a glance. And if space is an issue the Cardio Stride Plus is an excellent choice because Weslo’s SpaceSaver technology allows you to simply fold up the treadmill when you’re done for easy space savings. Weslo Cadence G-40 treadmill is an affordable and well-built fitness solution that offers numerous features and benefits that will help get you into shape quickly. 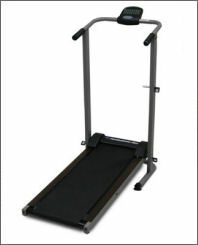 The Cadence G-40 treadmill offers numerous features that will effectively assist you in meeting your fitness goals. 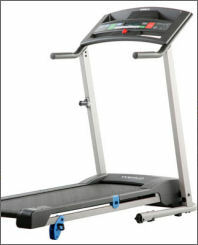 Features like impact reducing cushioning, adjustable incline, the spacious treadbelt, RaceTrack display, heart rate monitor, QuickSpeed control, 2.25 HP motor, and 4 built-in workout programs designed by a certified personal trainer ensure that you’ll get a great cardio workout every time and get into shape quickly. The Cadence G-40 is an affordable treadmill that offers all of the essential features you need to get into shape and keep fit. Weslo stands behind every piece of exercise equipment that they sell and they completely guarantee your satisfaction. Simply purchase your fitness machine (direct from Weslo) and use it for up to 30 days. If you’re not 100% satisfied with the results, simply contact Weslo's customer service department for a Return Authorization number and return the machine (including any accessories) in its original condition and packaging to receive a full refund, less a 10% restocking fee and the shipping & handling charges. * The above guarantee is for purchases made through Weslo only. Be sure to check the current return policy of all retail partners presented on TVgyms.com for the most up-to-date information. Weslo treadmills offer numerous innovative features and benefits such as Comfort Cell cushioning, roomy treadbelt surfaces, dual flywheels, Weslo's Easy Pulse heart rate monitor, adjustable incline, SpaceSaver design, easily viewable LCD displays that track important stats such as speed, time, distance and the amount of calories you've burned, QuickSpeed controls, built-in computerized workout programs, RaceTrack displays, ergonomically designed frames and components, and study construction. Weslo's goal is to offer fitness equipment that is affordable enough to fit all budgets while offering the quality that you would expect to only find in more expensive equipment. Weslo exercise equipment is a great choice if you're looking for economical and affordable fitness solutions that offer the essential features you need to get a great workout without adding a lot of costly extras. If your goal is to get into better shape while saving money at the same time, a high quality Weslo treadmill is just what the doctor ordered!